When a request is received by the portal, the profiler will compute a normalized instruction set, known as a profile locator. The locator is then added to the request context, from which subsequent components on the Jetspeed pipeline, most notably the Page Manager and Portal Site components, can take the profile locator and use it to find a requested resource. For example, the Page Manager uses the locator to find a page or folder. The Portal Site component uses the locator build the options on a menu. The profile locator is the output from the profiler. The input is a normalized set of runtime parameters and state. The profiler input is defined in profiling rules, and can be made of any Java class available on the pipeline. Jetspeed comes with quite a few predefined rules for taking criteria from request parameters, HTTP headers, security information, language and session attributes. The profiler is invoked during the Jetspeed request processing pipeline in the profiler valve. All of these runtime parameters are called the profile criterion, which the profiler uses to locate portal resources. The Profiler searches over a directory tree of PSML pages trying to locate a PSML page to be displayed. By default, this directory structure is found under WEB-INF/pages. The pages directory can also be stored in the database. This directory structure, comprised of portal resources (pages, folders, menus, links), is a physical representation of the portal site. The Jetspeed team plans to also support logical views of the portal site in future releases. 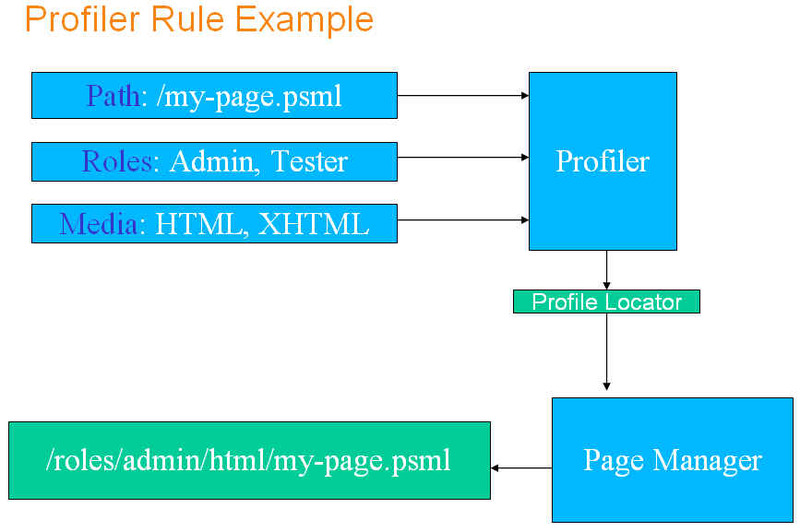 By applying profiling rules, the profiler locates pages in the portal site directory. A ProfilingRule defines a list of criteria used when evaluating a request to determine the location of a specific resource. Profiling rules are used by the profiler to locate portal resources based on the decoupled criteria for known portlet request data. A rule consists of an ordered list of criteria which should be applied in a given order. Following this rule's order, the profiling engine applies each criteria of the rule using a less-specific algorithm until the least specific resource criterion is considered. When all criteria are exhausted, the rule will fail and a fallback resource will be required. Type The type of criterion. Types are configured in the profiler spring configuraiton. Each type maps to a rule criterion resolver. A resolver is a Java class which maps request input to a normalized location instruction. Valid resolvers are provided in the table below. Fallback Order The sequential in which to apply this criterion within the profiling rule. Name The unique name (per rule) of this criterion. Upon matches, the name is mapped to the profile locator property name. Value The default value (not required) to use for this criterion when resolution fails. More complex implementations will need to use other inputs in mapping to resources such as Cookies, IP Address Ranges, Statistical Resource Usage Analysis, or Business Rules. The table below displays all default rule criterion resolvers available with Jetspeed out of the box. Resolvers are Java classes, implementing the interface from the Jetspeed API org.apache.jetspeed.profiler.rules.RuleCriterionResolver. You may use this default set of resolvers to build your own profiling rules. Rules are currently stored in the Jetspeed database. Portal administrators may edit the rules using an administrative portlet. In the demo system, login as the user "admin" to see an example of the Jetspeed Profiler Administration portlet. Additionally, you may add your own resolvers to Jetspeed. You will need to create a jar file holding your custom resolvers, and then drop them into the Jetspeed webapp's class path. Resolvers will need to be given a unique name. This is done by modifying the profiler.xml in the Spring assembly. See the section below on configuration to see where to add a resolver to the Spring configuration. role resolve by matching all of the security roles of the current authenticated user (in the JAAS Subject of the request context) and putting them in a comma-separated list. The locator property should be named role. The role criterion is often used in combination with path criteria, to create a role-fallback rule that searches over all security roles for a given user. group resolve by matching all of the groups of the current authenticated user (in the JAAS Subject of the request context) and putting them in a comma-separated list. The locator property should be named group. The group criteion is often used in combination with path criteria, to create a group-fallback rule that searches over all security groups for a given user. rolecombo resolve by matching all of the security roles of the current authenticated user (in the JAAS Subject of the request context) and putting them in a dash-separated string, for example: (role1-role2-role3). The locator property should be named role. The role criterion is often used in combination with path criteria, to create a role-fallback rule that searches over all security roles for a given user. Several rules are provided by default with the Jetspeed system. The rules in the table below display the criterion in a most-specific to least-specific ordering. A role based fallback algorithm, trying to find the most-specific resource by searching over all security roles for the current authenticated user. A group based fallback algorithm, trying to find the most-specific resource by searching over all security groups for the current authenticated user. The default profiling rule for users and mediatype minus language and country. The security profiling rule needed to force credential change requirements. Only criterion applied is the path portion of the portal URL. Rule will first look for the resource in the user's home folder. If not found there, a role based fallback algorithm is applied, trying to find the most-specific resource by searching over all security roles for the current authenticated user. Rule will first look for the resource in the user's home folder. If not found there, a role based fallback algorithm is applied, trying to find the most-specific resource by searching over all security roles for the current authenticated user. Creates a locater property named role that is the concatenation of all roles into one string, such as role1-role2-role3. This combined string is used as the role name in the locator. Profile Locators are used to locate profiled portal resources such as pages, folders, menus and links. A locator contains a collection of properties (name value pairs) describing the actual resource to be located. The profiler takes runtime information as input, generalized into generalized profile locators that are passed on to the page manager to locate a page or menu. The profile locators are normalized and not coupled to the profiler or page manager implementation.